Actually, anything by Mr. Welcher over at the Netcraftsmen blog I suggest reading. There a several different ways a vPC can be setup and they all have design considerations. Here is the topology we are going to use in this post to help visualize each type of vPC. For those who have not had a lot of exposure to Nexus vPC there are a few unfamiliar items. Most obvious are the dots. 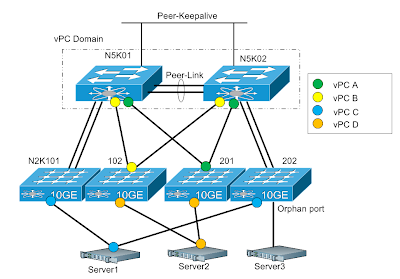 vPC ports are usually designated with colored dots to represent vPC membership. In the diagram above Server1 (uplinking to N2k101 and N2k202) is setup in a straght-through design. This design is prefered for servers with multiple NICs and can provide their own redundancy. You can dual-home but technically that is called enhanced vPC and only supported in newer versions of NX-OS. In the diagram above any server with a bond connected to either N2k102 or N2k201 would be considered a dual-homed setup. This design is preferred for servers with only a single NIC. Redundancy can at least be built into the FEX but the server is S.O.L if the NIC or uplink to the FEX goes down. In the diagram above Server2 (vPC D) is setup in an enhanced vPC design. Im on the fence if I would use this design so input from anyone would be great. vPC Domain - Group of two N5k, N6k or N7k devices (Peers) configured to host vPCs. Once a domain is formed an election is held to determine the primary and secondary role. Peers - Each Nexus switch in a domain is considered a peer. It is highly recommended to align the STP and vPC domain primary to the same switch. Peer Link - Dedicated link between vPC peers used to communicate and share vPC information. Even though the traffic utilization will not be high it is highly advised to setup your peer link in a port-channel for redundancy. Peer-Keepalive Link - Layer 3 routed link used to keep track of vPC peer status and availability. Mostly used to insure a split-brain scenario does not ruin your day when the peer-link fails. Cisco recommends running the peer-link over a management VRF and on the N5k using the mgmt0 interface. Cisco also recommends to not connect the peer-keepalive link interfaces in a point-to-point fasion, but to use a switched network. These recommendations kinda forces you to either dedicate your sole management port for simple keepalives or have a separate switched network to handle the keep-alive traffic. To work around its been suggested to configure a dedicated vlan across the peer-link port-channel. vPC Ports - Any port assigned to a vPC channel group. The colored dots in the diagram above all represent vPC ports. Orphaned Ports - Ports connecting devices in a non-vPC mode to a vPC topology. In the above diagram Server3 is connected to an orphaned port. It is highley recommended that all orphaned ports reside on the vPC primary due to loss of communication during a peer-link failure. Cisco Fabric Services (CFS) - Service used by vPC for peer scychronization of foward-plane information. Consistency checks are used by peers (similaur to traditional Port-channels) to verify vPC member ports can form a port-channel. OK, now that we have the theory out of the way and everyone has a good understanding of vPC we will next dig into vPC configuration and look at the various failure scenarios and the impact of each. Yeah as I started organizing the vPC post, it quickly grew past a single post. I should have two more vPC post coming after this, one on configuration and one on forwarding and failure scenarios. If you (or anyone) would like to see something specific, let me know and I'll try and get it incorporated. I thought the vPC+ is for the Fabric Path and it's different than enhanced vPC. In your diagram the vPC A is the enhanced vPC to me and the vPC+ in your diagram shouldn't work since the downstream devices (FEXs) are in the different vPC domain. Thanks! Wow look at that! thanks for the reply! Your right vPC+ is utilized in FabricPath to make a pair of Nexus switches in a single vPC domain appear as a single link. This is done by the vPC domain emulating a single switch for the traffic to flow through. I did not know this and I guess I picked up the term vPC+ and made it stick with Enhanced vPC. Thanks a ton! Ill correct the post to reflect this.